In addition to riding three or four days, I’m now also working at the barn two evenings a week. I say that partially as an explanation for why I am updating this blog so infrequently. But it also represents a huge turning point for me: I’m now actually getting paid to do what I love. Obviously teaching horseback riding to children two nights a week isn’t allowing me to quit my day job. But it’s a start on the path that hopefully one day leads to horse work being my life’s work. And it makes me think of the thousands of times I’d be stuck at my desk, consumed with depression because I never thought I’d find a way out, positive that there was no way I’d ever have the opportunity to do work that was meaningful to me. I was fond of saying, when particularly drained from the utter pointlessness and repetitiveness of the busywork I did all day at my last job, that I would rather be mucking stalls. At least then I’d be using my body instead of deteriorating in front of a computer. I don’t have to muck stalls at this job, but I certainly do use my body. 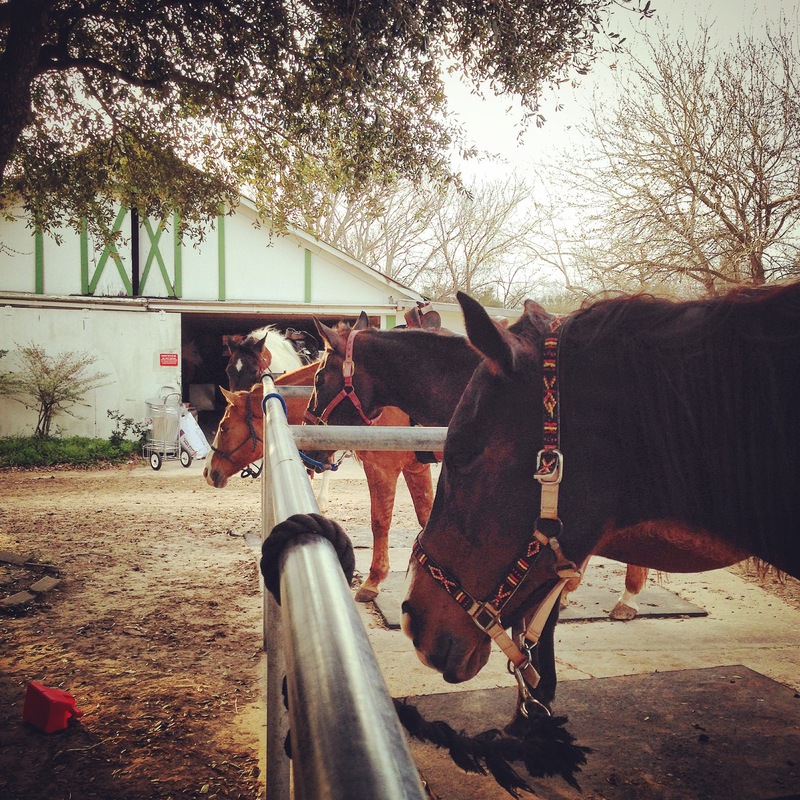 I’m in constant movement: getting the horses from their stalls, grooming them and picking their hooves and tacking them up and untacking them and putting the equipment away and turning them out, cleaning up the barn and the tack room and the arena. And that’s not even taking into account the work in the ring with my students: lugging the mounting block around, helping them mount, walking (or running) alongside them to help them control their horses or understand new concepts, moving around poles and jump standards…I downloaded a step counter for my phone, and in the approximately 3 1/2 hours I work in an evening, I easily get in 8,000–10,000 steps. And that’s after doing all those things with Dunnie and then riding him. The first week I worked, I was utterly wrecked. But I also slept amazingly. And I can already feel my legs getting stronger and tighter, and my posture improving, and even my pants fitting a little less tightly. The work isn’t just physical, either. It’s totally mentally engaging. It has to be. When you’re dealing with large animals and small children, safety is the utmost concern. So there’s the running mental checklist and potential-disaster-scanner part of your mind that’s always going. On top of that, teaching riding is all about problem solving. You tell the children what to do. Since they’re not only new at this, but it’s also an activity that takes body awareness, coordination, sensitivity, cooperation, and muscles that few other activities or circumstances provide the opportunity to exercise, it takes quite a while for them to learn how to do what you’re telling them to do. The indicators of whether they’re doing it right are large, obvious behavioral outcomes — like whether they are able to get the thousand-pound animal underneath them to trot, for example — but all of the factors that may contribute to or prevent success in reaching that outcome are extremely subtle and involve an intuitive alchemy that’s not always easy to articulate. So much of what goes on when teaching riding is looking at the horse to see if it’s moving in the way that you’d expect it to based on the instructions you gave the rider. Then if it’s not, you have to analyze the many potential cues the rider is giving the horse to confuse it. Sometimes it’s obvious, like the rider is telling the horse “go!” with her legs, but also pulling back on the reins, which tells the horse “stop!”. But other times, there are signals sent through the body that aren’t even visible. So you go through the catalog of your own riding experience, thinking about horses you’ve ridden that are similar to this one and how you solved the problems then. You ask your student creative questions about what she’s feeling from the horse that allow you to project yourself onto the horse’s back with her so you can understand what’s going on. Ultimately, more than teaching just a sport or a physical skill, what you’re teaching when you teach riding is a language. You’re instructing someone how to communicate with an entirely different species. To convince a creature way, way bigger than them to accept that they have the authority to decide where to go and how fast to get there. It requires instilling an understanding that they must talk with the animal through their hands and legs and seat, using the symbols that the horse has been trained to understand the meaning of in terms of actions. One of the biggest things to overcome there is to make people understand that even though the horse has been trained to respond to these cues, they aren’t machines that will react as though we’ve pushed a button — especially because so much of our lives are infused with technology that works in exactly that way — and that instead they are living things with whom you must take into account personality, preference, mood. So many of the questions students ask me center around trying to come to grips with that. They ask, “Why is she doing that?” “Does he always act like this?” “Do the horses like each other?”, and many others that reveal their attempts to piece together an understanding of the horse’s mental life. I love trying to answer those questions more than any others, because it feels like I’m handing someone missing puzzle pieces that they’re fitting in to get a picture of something elusive and beautiful. Starting to teach has also prompted me to step up my already pretty intense desire to learn, and ever since Dunnie and I got back to work after the holidays and his short stint of lameness, we’ve been reaching some new levels of refinement. I’ve been working a lot on trying to make his responses to my cues crisper; asking him to react more quickly and strongly to ever-decreasing amounts of pressure from my leg and hands. It’s been going pretty well in most areas. We canter all around the ring now and I ask him for lead changes at random times and in random places. The changes are smoother and more accurate, and since I’m keeping him on his toes now, he doesn’t have the opportunity to anticipate when he thinks he should change the lead. So when we canter circles and I don’t ask him, he’s not constantly switching around the turns like he was before. I also realized that by using more leg pressure to turn when I am planning to ask him for a lead change — speaking more loudly with my outside leg, as it were — then the cue to change is clearer to him when I take that leg away and give pressure with the other to ask him to switch (which means I can speak softer with that leg). The constant refinement of our communication is a really interesting process to me. It’s kind of like the longer you’re in a relationship or a friendship with someone, your communication flows more easily through the way you use shorthand or inside jokes to refer to something you both know together. I feel that happening with Dunnie now, like we are really connecting.